A hungry bear wakes with a rumbling tummy. After looking everywhere for some food, he jumps in his car and goes in search of a hive. Happily, he finds one but there are also bees and they aren’t going to allow him to just take their honey. Pretty soon, the hungry bear learns that it’s better to ask nicely than take what isn’t yours. 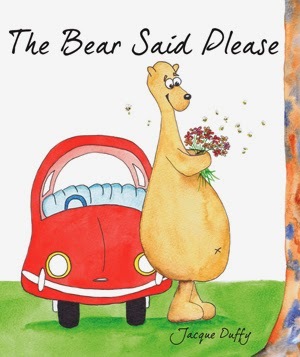 The Bear Said Please is a lovely book that teaches the importance of good manners with gentleness and humour. Written in rhyme, there is a good rhythm that helps the story bounce along and makes this a great read-out-aloud book. And went for a drive. Visually, I found the book really charming. The illustrations are beautiful - simple and engaging – and I personally love Jacque Duffy’s particular artistic style. The layout and placement of the text also contributes to the visual appeal this book: sometimes going up, diagonally or in circles. Overall, I really enjoyed The Bear Said Please and would recommend it to anyone with a young person that needs to learn some manners (or learn what not to do around bees).